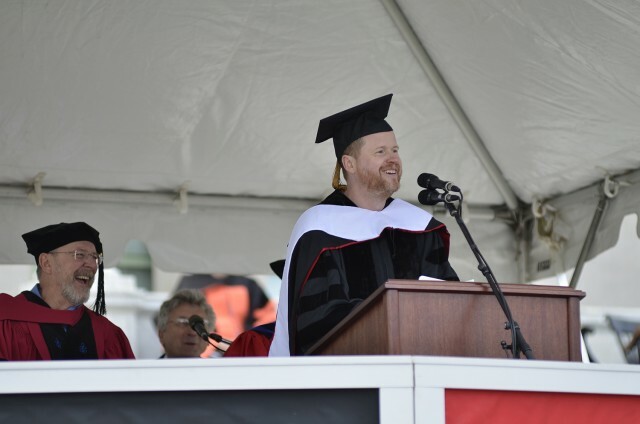 Joss Whedon ’87 delivered the Wesleyan Commencement Address. On March 10, 1997, the first episode of Buffy the Vampire Slayer aired on the WB channel. I don’t remember what day it aired on because it changed to different nights throughout its television career. No matter the day, my mom, my brother, and I would sit in a room together to watch Buffy conquer vampires and other supernaturals while slaying those pesky homework assignments. I was in sixth grade at the time. My mom had moved my brother and I into her boyfriend’s house because we were forced to move out of our previous house. Long story short, my dad didn’t pay the monthly mortgage, so we had to live elsewhere. I was in a new house that was thirty minutes away from my private school. Junior high was turning out to be this horrible part of the education system where I didn’t get to play the playground with my friends anymore. It was now all work and no play because my friends were now busier and more importantly I couldn’t relate to my fellow peers. This is where BVS comes into play. I could relate to Buffy, Willow, and Xander’s butting heads with high school. I wasn’t liking Junior high too much. It seemed like it only to became worse each year. I could relate to being demeaned by my peers because I didn’t follow society’s standard or in Cordelia’s case, her standard. My school believed in a Christian based faith. It taught almost an hour of Bible every day. There was a definite standard to follow. I was far from following it. I wasn’t excited about who I liked or what boy band was trending. I was excited about Vampires and other dead things. I had a hole in my heart from many things and I wanted to fill it with something tangible. Buffy killed vampires. 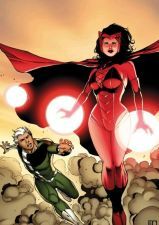 She won over evil. Just when we think she is done for, she surprises us. I wanted to be someone whose courage and passion surprised them when they least expected it. Seeing forgiveness, friendship, and love in this show taught me the things my parents, teachers, & peers couldn’t or wouldn’t teach me. Seeing forgiveness, friendship, and love in this show taught me the things my parents, teachers, & peers couldn't or wouldn't teach me. 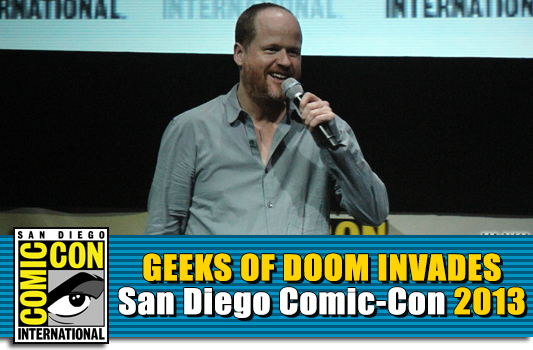 I would be remiss if I did not put this out there, being the huge Whedon fan that I am. You know, I wouldn’t go back, I’d go forward. I would want to create characters that would resonate the way that they did. I mean not that I don’t want to see [the new movies], I would be excited to, but I also feel like I would want to explore a very different part of that universe. And if there was a Han Solo solo film, would he have a hand in something that meant recasting the famous character? “That I would never want to do. Some things may not be rebooted,” he said, in his most serious voice. A huge thank you to amandaonzeteo For recording this video so people who were not lucky enough to attend could see it! Home Posts tagged "Joss Whedon"